The main block of this art academy comprises classrooms for theory, design and drawing, the assembly hall and a brick-walled gymnasium. An L-shaped annexe contains workshops. By placing the facades 40 cm. in front of the floors its glazed skin could be stretched without interruption from ground to roof, creating an all-glass box. There is an abundance of glass inside, too, all upper sections of wall partitions being glazed and walls between classrooms and corridors consisting largely of glass display cases. In 2005 the academy was restored and a new climate control system installed rendering redundant the distinctive wall ventilation units. The facades of the new-build are again of glass: small square ribbed panels on three sides and, crucial for the artists studying here, clear glass on the north-facing facade. 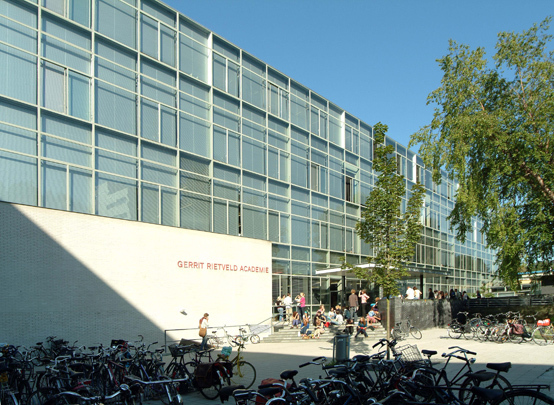 Rietveld designed a similar Art Academy in Arnhem.